A stretch wrap machine exclusively designed for the unique requirements of the small roll products industry! The custom-designed Synergy Roll Wrapper for small applications will quickly and economically apply stretch film to your roll products, providing protection and total encapsulation. This will allow you to reduce or eliminate your costly current packaging method while providing both a user- and environmentally-friendly solution. 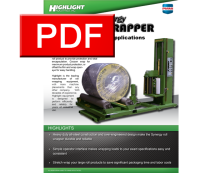 Highlight is the leading manufacturer of roll wrapping equipment, with more machine placements than any other company. With decades of experience, Highlight equipment is designed to perform efficiently and reliably for years of industrial use. The Large Roll Wrapper is available with semi-automatic or fully automatic controls pakages. From small rolls to large rolls, the Highlight Horizontal Roll Wrapper can handle them all! Integrated Master Control touch screen provides superior control over all machine functions. Help messages for all machine functions are always available to the operator. Film knife automatically scores film for final tear-off from product at end of cycle. Film Assist temporarily energizes the power pre-stretch system so the operator can easily pull film down to the load. 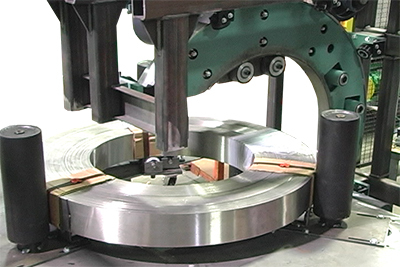 The Revolver systems are specially designed to accurately and consistently wrap coiled and roll products. The unique C-Style design of the ring allows for wrapping through the eye of the coil, providing complete coverage while maintaining ease of handling. 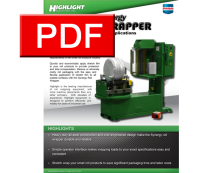 The vertical design of the C-Style Wrapper allows the product to be lifted into the machine by crane and then set in place to be wrapped and removed. The Revolver systems are uniquely designed to wrap and protect roll and coil products. The C-Style design of the Revolver allows wrapping coiled and roll products through the eye, providing complete coverage and easy handling. The horizontal design allows the system to be integrated with conveyors. This allows for automatic and continuous wrap cycles to increase productivity. Any coil or roll that can be conveyed can be easily and economically wrapped on the C-Style Revolver. The world's largest stretch wrapping system The CoilMaster, is a stretch wrap system designed to meet the requirements of the metal industry. The CoilMaster's unique track and shuttle design allows the entire surface, including inside the eye of massive steel coils to be completely wrapped. Highlight's CoilMaster is a completely customizable system, specially made for each application. 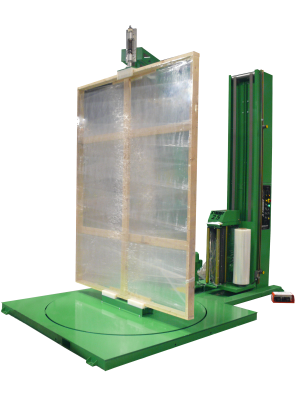 A stretch wrapper exclusively designed for the unique requirements of the window and door industry! The custom designed Synergy Window Wrapper will quickly and economically protect your fragile products, where appearance is a priority, while allowing you to reduce or eliminate your costly current corrugated protection. Double cylinder style for fast, accurate roping of pallet corners. Pallet corners cut at 45°; product fully wrapped. Pallet & bottom of product roped. bottom roping roller curls bottom of stretch film for additional strength.